The Lenovo Z5 Pro will have a 24MP and 16MP rear camera pairing, according to a new teaser image. Lenovo’s phone won’t be the only slider smartphone released in 2018. The Lenovo Z5 Pro is tentatively looking like a pretty fantastic flagship phone — if the company isn’t planning another bait and switch. The company has delivered a few nuggets of information about the device in recent weeks, and today brings some camera details. Lenovo executive Chang Cheng published a teaser image on Weibo (h/t: GSMArena), revealing that the upcoming slider phone has a 24MP and 16MP camera pairing. Now, this could refer to the selfie cameras at first glance, but a closer look at the phone’s screen (full size image) reveals a “24MP+16MP dual camera” watermark. And the picture on the phone’s display shows a building rather than a selfie — clearly we’re looking at a 24MP+16MP rear camera combination. The teaser image also mentions an AI-powered super night mode and an AI super video mode. 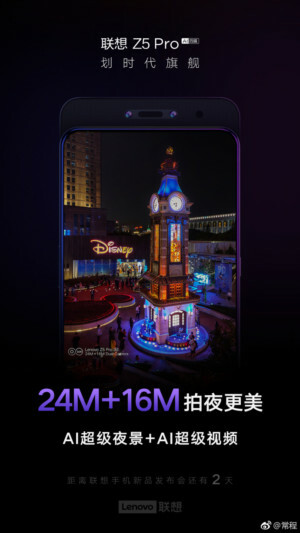 The super night mode is most likely similar to Huawei, Google and Xiaomi‘s advanced night modes, using image stacking and other techniques to reduce noise and increase detail. It’s not clear what is meant by an AI super video mode, but it could potentially be related to stabilization, object tracking, or fancy video effects. Cheng has previously posted several other Lenovo Z5 Pro teasers, mentioning features such as a security chip and Dolby Atmos capabilities. The executive also shared a video a few weeks ago, showing a slider phone that looks similar to the Z5 Pro, complete with an in-display fingerprint sensor. The Lenovo Z5 Pro won’t be the only slider phone to launch this year, as it’s joined by the Xiaomi Mi Mix 3, Honor Magic 2, and Oppo Find X. The move to the slider form factor allows manufacturers to ditch the notch, as earpieces, cameras and other sensors can be accommodated on the slider instead. But with the likes of Samsung reportedly moving the various sensors under the screen, could the slider form factor be a temporary measure?